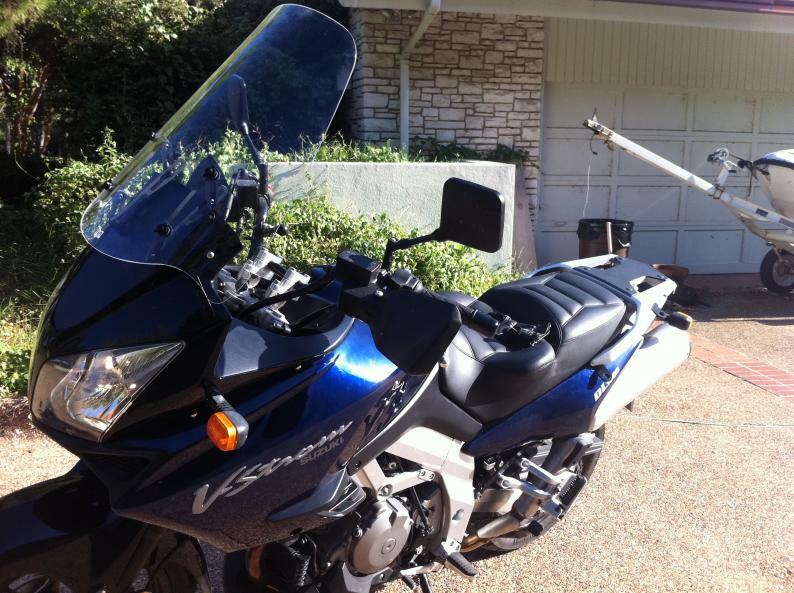 Stromtrooper Forum : Suzuki V-Strom Motorcycle Forums > Popular Forums > DL1000 from 2002-2012 > Wind/Windscreen/Buffeting thread for the 2002-2003 DL1000, the only one! Wind/Windscreen/Buffeting thread for the 2002-2003 DL1000, the only one! I am the original owner of a rarely ridden '02 DL1000. 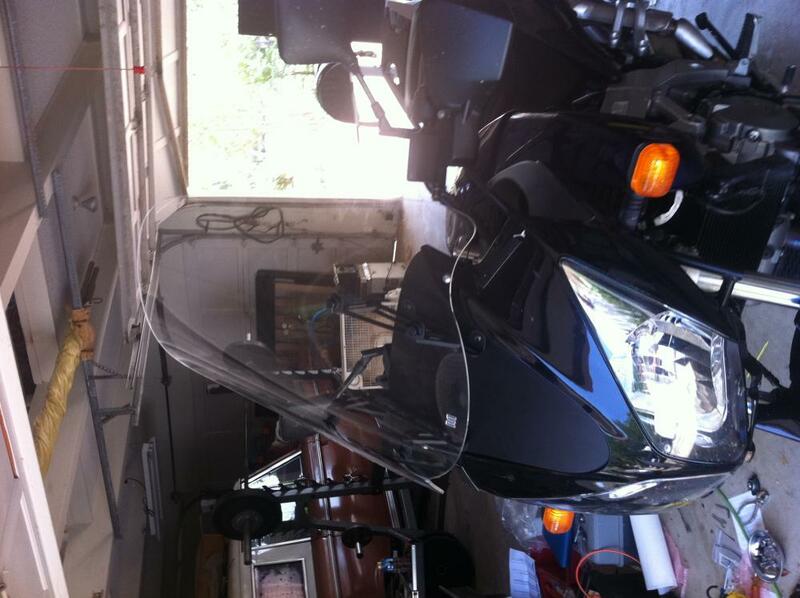 The huge negative for me on this bike has been the windshield agony, horrid buffet specifically. Being an "early adopter" as the marketing types say, I did the whole Suzuki tall, Velcroed on taller and wider, Cee Baily, laminar lips, etc. Better, but still sucked - literally. Each spring I'd poke at this fine forum and see what, is anything was to be done. I'd even been tempted to spend the $$ to upgrade my hardware to 04 to break the vacuum hassle. This spring whilst lurking about I spotted a reference to MadStad. Poking around their www a pic of a new system of theirs that would work on an early Vstrom. No price or BuyNow enabled. Long story short, after lots of friendly emails (they wanted to be sure they had it right) I received this past week a MadStad system for my '02. He uses a black aluminium plate where the stock buffet creator (windshield) would go. 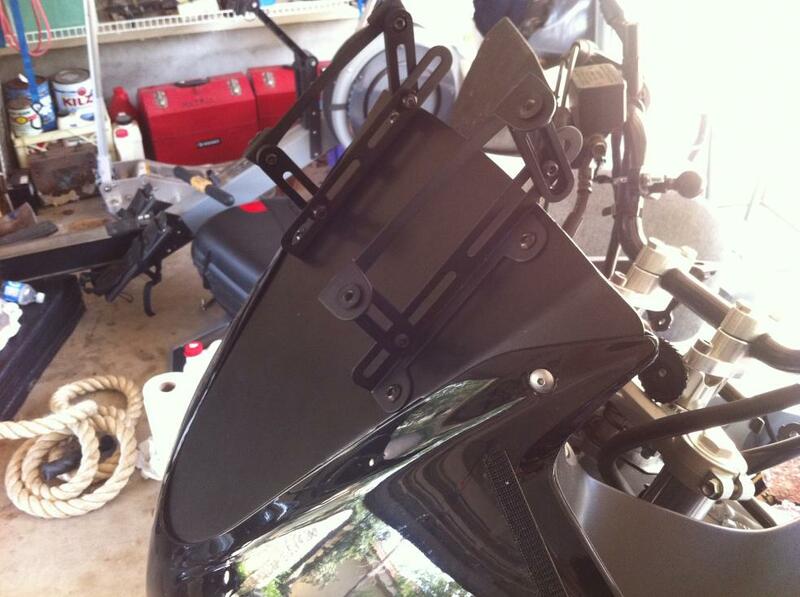 Mounts his clever brackets to that, new screen to those. Unit went on without a hitch. All buffet is gone, like the memory of a tooth ache. I'm messing with the adjustments now, but at 6'3" his stock height will be more then enough. If you have an early DL, there is no better mod you could do. Thanks much to all you frequent posters on this site. That's good news - I've been riding my K3 for years with a shorty screen, which is a lot better than the original (or the Suzuki tall, or the laminar lip - I gave up after that). On a cold day (like today in Aus) it would be nice to have a bit more protection. What screen are you using - does it come with the brackets? What sort of price were the brackets & screen? WOW that really looks nice. It looks like they will be having another customer soon. It's kind of strange, how the mountains pay us no attention at ll. You laugh or cry and the wind just keeps on blowing. Kudos to Madstad for the help on this. I am running a modified MP Design ( they are out of business, had a unique bracket that allows some further mods ) and with quite a bit of work I have the buffeting and noise lower than it is on my RT! Looks like this design puts the screen in a similar position and has a proper base to hold everything securely. The screen is MadStad and came with it. He offers different tints. I thought I'd want a taller one, but he talked me into sticking with his stock 22". He was right. Everything was included, adapter plate, his cool brackets, screen, etc. Like I said in my original post, a game changer. Nice vintage bronco in the back ground! Congrats on finally getting your windshield sorted out! So what screen are you using? I did something very similar a few years back. I took the original madstads and modified them to a plate much like this one. I did a write up over on VSRI, did the trick for me. Did you get the screen directly from madstad or from one of their distributors like twisted throttle? I will be ordering one monday morning,what the heck after all the money I have spent on screens the last 10 years this is a bargain. I'm 6'2" and the MadStad was an incredible improvement to painful ride at highway speed. I got the tall model. Couldn't be more pleased.